The aggregate market value of the common stock held by non-affiliates of the Registrant, computed by reference to the closing sale price on The NASDAQ Stock Market as of the last business day of the Registrant’s most recently completed second fiscal quarter, June 26, 2016, was $1,783,791,775. As of February 14, 2017, there were 36,755,723 shares of the Registrant’s common stock outstanding. Portions of Part III of this annual report are incorporated by reference to the Registrant’s Proxy Statement for the Annual Meeting of Stockholders to be held April 27, 2017. Papa John’s International, Inc., a Delaware corporation (referred to as the “Company”, “Papa John’s” or in the first person notations of “we”, “us” and “our”) operates and franchises pizza delivery and carryout restaurants and, in certain international markets, dine-in and delivery restaurants under the trademark “Papa John’s”. Papa John’s began operations in 1984. At December 25, 2016, there were 5,097 Papa John’s restaurants in operation, consisting of 744 Company-owned and 4,353 franchised restaurants operating domestically in all 50 states and in 45 countries and territories. Our Company-owned restaurants include 222 restaurants operated under five joint venture arrangements and 42 units in Beijing and North China. Papa John’s has defined five reportable segments: domestic Company-owned restaurants, North America commissaries (Quality Control Centers), North America franchising, international operations, and “all other” business units. North America is defined as the United States and Canada. Domestic is defined as the contiguous United States. International franchisees are defined as all franchise operations outside of the United States and Canada. See “Management’s Discussion and Analysis of Financial Condition and Results of Operations” and “Note 20” of “Notes to Consolidated Financial Statements” for financial information about our segments. All of our periodic and current reports filed with the Securities and Exchange Commission (the “SEC”) pursuant to Section 13(a) or 15(d) of the Securities and Exchange Act of 1934, as amended (the “Exchange Act”), are available, free of charge, through our website located at www.papajohns.com, including our annual reports on Form 10-K, quarterly reports on Form 10-Q, current reports on Form 8-K and any amendments to those reports. Those documents are available through our website as soon as reasonably practicable after we electronically file them with the SEC. We also make available free of charge on our website our Corporate Governance Guidelines, Board Committee Charters, and our Code of Ethics, which applies to Papa John’s directors, officers and employees. Printed copies of such documents are also available free of charge upon written request to Investor Relations, Papa John’s International, Inc., P.O. Box 99900, Louisville, KY 40269-0900. You may read and copy any materials filed with the SEC at the SEC’s Public Reference Room at 100 F Street, NE, Washington, DC 20549. You may obtain information on the operation of the Public Reference Room by calling the SEC at 1-800-SEC-0330. This information is also available at www.sec.gov. The references to these website addresses do not constitute incorporation by reference of the information contained on the websites, which should not be considered part of this document. Our goal is to build the strongest brand loyalty in the pizza industry by delivering on our “Better Ingredients. Better Pizza.” promise. Recognized as a trusted brand and quality leader in the domestic pizza category, our objective is to build our brand on a global basis by executing the key elements of our strategy. High-Quality Menu Offerings. Our menu strategy focuses on the quality of our ingredients. Domestic Papa John’s restaurants offer high-quality pizza along with side items, including breadsticks, cheesesticks, chicken poppers and wings, dessert items and canned or bottled beverages. Papa John’s traditional crust pizza is prepared using fresh dough (never frozen). We also introduced a fresh dough pan crust in 2016; this is the first new crust offered in 10 years. Papa John’s pizzas are made from a proprietary blend of wheat flour, real cheese made from mozzarella, fresh-packed pizza sauce made from vine-ripened tomatoes (not from concentrate) and a proprietary mix of savory spices, and a choice of high-quality meat and vegetable toppings. Our traditional crust pizza is delivered with a container of our special garlic sauce and a pepperoncini pepper. In addition to our fresh dough pizzas, we offer a par-baked thin crust. Each is served with a pepperoncini pepper. We have a continuing “clean label” initiative to remove unwanted ingredients from our product offerings, such as synthetic colors, artificial flavors and preservatives, announcing in 2016 that we had removed an additional fourteen unwanted ingredients across our entire food menu during the year. We also offer limited time pizzas on a regular basis and expect to continue to test new product offerings both domestically and internationally. The new products can become a part of the permanent menu if they meet certain internally established guidelines. All ingredients and toppings can be purchased by our Company-owned and franchised restaurants from our North American Quality Control Center (“QC Center”) system, which delivers to individual restaurants twice weekly. To ensure consistent food quality, each domestic franchisee is required to purchase dough and pizza sauce from our QC Centers and to purchase all other supplies from our QC Centers or other approved suppliers. Internationally, the menu may be more diverse than in our domestic operations to meet local tastes and customs. Most QC Centers outside the U.S. are operated by franchisees pursuant to license agreements or by other third parties. The Company operates three international QC Centers in Mexico, the United Kingdom (“UK”), and China. We provide significant assistance to licensed QC Centers in sourcing approved quality suppliers. All of the QC Centers are required to meet food safety and quality standards and to be in compliance with all applicable laws. Efficient Operating System. We believe our operating and distribution systems, restaurant layout and designated delivery areas result in lower restaurant operating costs and improved food quality, and promote superior customer service. Our QC Center system takes advantage of volume purchasing of food and supplies and provides consistency and efficiencies of scale in fresh dough production. This eliminates the need for each restaurant to order food from multiple vendors and commit substantial labor and other resources to dough preparation. Commitment to Team Member Training and Development. We are committed to the development and motivation of our team members through training programs, incentive and recognition programs and opportunities for advancement. Team member training programs are conducted for Company-owned restaurant team members, and operational training is offered to our franchisees. We offer performance-based financial incentives to corporate team members and restaurant managers. Marketing. Our domestic marketing strategy consists of both national and local components. Our national strategy includes national advertising via television, print, direct mail, digital, mobile marketing and social media channels. Our digital marketing activities have increased significantly over the past several years in response to increasing consumer use of online and mobile web technology. Local advertising programs include television, radio, print, direct mail, store-to-door flyers, digital, mobile marketing and local social media channels. See “Marketing Programs” below which describes more local marketing programs. In international markets, our marketing focuses on reaching customers who live or work within a small radius of a Papa John’s restaurant. Our international markets use a combination of advertising strategies, including television, radio, print, digital, mobile marketing and local social media depending on the size of the local market. Technology. We use technology to both enhance the customer experience and improve efficiencies in our Company-owned and franchised restaurants. Our proprietary digital ordering platform processes over half of domestic restaurant sales and allows customers to order online. In 2016, we also launched ordering on Apple TV. Our alternative payment technologies include VISA checkout, PayPal, Google Hands Free and Venmo PayShare. Our Papa Rewards® program is a customer loyalty program designed to increase customer loyalty and frequency of digital ordering, enhanced in 2016 through redemption offerings including sides and desserts in addition to pizza. We have internally developed and continue to upgrade our domestic proprietary point-of-sale technology, which we refer to as “FOCUS”. We believe the FOCUS system facilitates fast and accurate order-taking and pricing and is an easy tool for restaurant operators to learn and use. The FOCUS system is also integrated with our digital ordering solutions in all domestic traditional Papa John’s restaurants, enabling Papa John’s to offer nationwide digital ordering to our customers. Strong Franchise System. We are committed to developing and maintaining a strong franchise system by attracting experienced operators, supporting them to expand and grow their business and monitoring their compliance with our high standards. We seek to attract franchisees with experience in restaurant or retail operations and with the financial resources and management capability to open single or multiple locations. While each Papa John’s franchisee manages and operates its own restaurants and business, we devote significant resources to providing franchisees with assistance in restaurant operations, training, marketing, site selection and restaurant design. Our strategy for global unit growth focuses on our strong unit economics model. We strive to eliminate barriers to expansion in existing international markets, and identify new market opportunities. Our growth strategy varies based on the maturity and penetration of the market and other factors in specific domestic and international markets, with overall unit growth expected to come increasingly from international markets. We are committed to maintaining strong restaurant unit economics. In 2016, the 694 domestic Company-owned restaurants included in the full year’s comparable restaurant base generated average annual unit sales of $1.16 million. Our North American franchise restaurants, which included 2,363 restaurants in 2016, generated average annual unit sales of $883,000. North American franchise restaurant sales are lower than Company-owned restaurants as a higher percentage of our Company-owned restaurants are located in more heavily penetrated markets. With few exceptions, domestic restaurants do not offer a dine-in area, which reduces our restaurant capital investment. The average cash investment for the 12 domestic traditional Company-owned restaurants opened during 2016, exclusive of land, was approximately $339,000 per unit, compared to the $319,000 investment for the 11 domestic traditional units opened in 2015, excluding tenant allowances that we received. Over the past few years we have experienced an increase in the cost of our new restaurants primarily as a result of building larger units to accommodate increased sales, an increase in the cost of certain equipment as a result of technology enhancements, and increased costs to comply with applicable regulations. We define a “traditional” domestic Papa John’s restaurant as a delivery and carryout unit that services a defined trade area. We consider the location of a traditional restaurant to be important and therefore devote significant resources to the investigation and evaluation of potential sites. The site selection process includes a review of trade area demographics, target population density and competitive factors. A member of our development team inspects each potential domestic Company-owned restaurant location and substantially all franchised restaurant locations before a site is approved. Papa John’s restaurants are typically located in strip shopping centers or freestanding buildings that provide visibility, curb appeal and accessibility. Our restaurant design can be configured to fit a wide variety of building shapes and sizes, which increases the number of suitable locations for our Company-owned and franchised restaurants. A typical traditional domestic Papa John’s restaurant averages 1,100 to 1,500 square feet with visible exterior signage. “Non-traditional” Papa John’s restaurants generally do not provide delivery service but rather provide walk-up or carry out service to a captive customer group within a designated facility, such as a food court at an airport, university or military base or an event-driven service at facilities such as sports stadiums or entertainment venues. Non-traditional units are designed to fit the unique requirements of the venue and may not offer the full range of menu items available in our traditional restaurants. All of our international restaurants are franchised, except for 42 Company-owned restaurants in Beijing and North China. Generally, our international Papa John’s restaurants are slightly smaller than our domestic restaurants and average between 900 and 1,400 square feet; however, in order to meet certain local customer preferences, some international restaurants have been opened in larger spaces to accommodate both dine-in and restaurant-based delivery service, typically with 35 to 140 seats. A total of 343 Papa John’s restaurants were opened during 2016, consisting of 13 Company-owned and 330 franchised restaurants (104 in North America and 226 internationally), while 139 Papa John’s restaurants closed during 2016, consisting of four Company-owned (one in North America and three internationally) and 135 franchised restaurants (63 in North America and 72 internationally), representing net global unit growth of 204 restaurants. that market penetration through the opening of multiple restaurants in a particular market results in increased average restaurant sales in that market over time. We have co-developed domestic markets with some franchisees or divided markets among franchisees and will continue to utilize market co-development in the future, where appropriate. Of the total 3,441 North American restaurants open as of December 25, 2016, 702 or 20% were Company-owned (including 222 units owned in joint venture arrangements with franchisees in which the Company has a majority ownership position). Operating Company-owned restaurants allows us to improve operations, training, marketing and quality standards for the benefit of the entire system. From time to time, we evaluate the purchase or sale of units in significant markets, which could change the percentage of Company-owned units. Of the 1,656 international restaurants open as of December 25, 2016, 42 or 2.5% were Company-owned (all of which are located in Beijing and North China). We plan to sell the Company-owned China restaurants and the China QC Center in the next 12 months. Accordingly, as of December 25, 2016, the Company’s China operations, including these restaurants and the QC Center, are classified as held for sale in the accompanying consolidated financial statements. Our North American QC Center system is currently comprised of 10 full-service regional production and distribution centers in the U.S. which supply pizza sauce and dough, food products, paper products, smallwares and cleaning supplies twice weekly to each traditional restaurant it serves. Additionally, we have one QC Center in Canada that produces and distributes dough. This system enables us to monitor and control product quality and consistency, while lowering food and other costs. We evaluate the QC Center system capacity in relation to existing restaurants’ volumes and planned restaurant growth, and facilities are developed or upgraded as operational or economic conditions warrant. In 2017, we plan to complete construction of and open an additional North American full-service QC Center in Georgia. We currently own full-service international QC Centers in Milton Keynes, United Kingdom, Mexico City, Mexico, and Beijing, China. Other international QC Centers are licensed to franchisees or non-franchisee third parties and are generally located in the markets where our franchisees have restaurants. We set quality standards for all products used in Papa John’s restaurants and designate approved outside suppliers of food and paper products that meet our quality standards. To ensure product quality and consistency, all domestic Papa John’s restaurants are required to purchase pizza sauce and dough from QC Centers. Franchisees may purchase other goods directly from our QC Centers or other approved suppliers. National purchasing agreements with most of our suppliers generally result in volume discounts to us, allowing us to sell products to our restaurants at prices we believe are below those generally available to restaurants in the marketplace. Within our North American QC Center system, products are primarily distributed to restaurants by leased refrigerated trucks operated by us. Our local restaurant-level marketing programs target consumers within the delivery area of each restaurant through the use of local television, radio, print materials, targeted direct mail, store-to-door flyers, digital display advertising, email marketing, text messages and local social media. Local marketing efforts also include a variety of community-oriented activities within schools, sports venues and other organizations supported with some of the same advertising vehicles mentioned above. Domestic Company-owned and franchised Papa John’s restaurants within a defined market may be required to join an area advertising cooperative (“Co-op”). Each member restaurant contributes a percentage of sales to the Co-op for market-wide programs, such as television, radio, digital and print advertising, and sports sponsorships. The rate of contribution and uses of the monies collected are determined by a majority vote of the Co-op’s members. The contribution rate for Co-ops generally may not be below 2% of sales without approval from Papa John’s. commercials, buys digital media such as banner advertising, paid search-engine advertising, mobile marketing, social media advertising and marketing, text messaging, and email. It also engages in other brand-building activities, such as consumer research and public relations activities. Domestic Company-owned and franchised Papa John’s restaurants are required to contribute a certain minimum percentage of sales to PJMF. The contribution rate to PJMF can be set at up to 3% of sales, if approved by the governing board of PJMF, and beyond that level if approved by a supermajority of domestic restaurants. The domestic franchise system approved a new contribution rate of 4.25% effective in the fourth quarter of 2016. The new rate is an increase of 0.25% from the 4.0% contribution rate that had been in place since 2011. The rate will increase an additional 0.25% in annual increments until the rate reaches 5.0% of sales in 2019. Our proprietary domestic digital ordering platform allows customers to order online, including “plan ahead ordering,” Apple TV ordering and Spanish-language ordering capability. Digital payment platforms include VISA Checkout, PayPal, Google Hands Free and Venmo PayShare. We provide enhanced mobile web ordering for our customers, including Papa John’s iPhone® and Android® applications. Our Papa Rewards® program is a customer loyalty program designed to increase loyalty and frequency; we offer this program domestically and in the UK. We receive a percentage-based fee from North American franchisees for online sales, in addition to royalties, to defray development and operating costs associated with our digital ordering platform. We believe continued innovation and investment in the design and functionality of our online and mobile platforms is critical to the success of our brand. Our domestic restaurants offer customers the opportunity to purchase reloadable gift cards, sold as either a plastic gift card purchased in our restaurants, or an online digital card. Gift cards are sold to consumers on our website, through third-party retailers, and in bulk to business entities and organizations. We continue to explore other gift card distribution opportunities. Gift cards may be redeemed for delivery, carryout, and digital orders and are accepted at all Papa John’s traditional domestic restaurants. We provide both Company-owned and franchised restaurants with pre-approved marketing materials and catalogs for the purchase of promotional items. We also provide direct marketing services to Company-owned and domestic franchised restaurants using customer information gathered by our proprietary point-of-sale technology (see “Company Operations — Domestic Point-of-Sale Technology”). In addition, we provide database tools, templates and training for operators to facilitate local email marketing and text messaging through our approved tools. In international markets, our marketing focuses on customers who live or work within a small radius of a Papa John’s restaurant. Certain markets can effectively use television and radio as part of their marketing strategies. The majority of the marketing efforts include using print materials such as flyers, newspaper inserts, in-store marketing materials, and to a growing extent, digital marketing such as display, search engine marketing, social media, mobile marketing, email, and text messaging. Local marketing efforts, such as sponsoring or participating in community events, sporting events and school programs, are also used to build customer awareness. Domestic Restaurant Personnel. A typical Papa John’s Company-owned domestic restaurant employs a restaurant manager and approximately 20 to 25 hourly team members, many of whom work part-time. The manager is responsible for the day-to-day operation of the restaurant and maintaining Company-established operating standards. We seek to hire experienced restaurant managers and staff and provide comprehensive training programs in areas such as operations and managerial skills. We also employ directors of operations who are responsible for overseeing an average of seven Company-owned restaurants. Senior management and corporate staff also support the field teams in many areas, including, but not limited to, quality assurance, food safety, training, marketing and technology. We seek to motivate and retain personnel by providing opportunities for advancement and performance-based financial incentives. Training and Education. The Global Operations Support and Training department is responsible for creating tools and materials for the operational training and development of both corporate and franchise team members. We believe training is very important to delivering consistent operational execution. Operations personnel complete our management training program and ongoing development programs, including multi-unit training, in which instruction is given on all aspects of our systems and operations. North America Point-of-Sale Technology. Our proprietary point-of-sale technology, “FOCUS”, is in place in all North America traditional Papa John’s restaurants. We believe this technology facilitates fast and accurate order-taking and pricing, and allows the restaurant manager to better monitor and control food and labor costs, including food inventory management and order placement from the North American QC Centers. The system allows us to obtain restaurant operating information, providing us with timely access to sales and customer information. The FOCUS system is also integrated with our digital ordering solutions in all North American traditional Papa John’s restaurants. Domestic Hours of Operation. Our domestic restaurants are open seven days a week, typically from 11:00 a.m. to 12:30 a.m. Monday through Thursday, 11:00 a.m. to 1:30 a.m. on Friday and Saturday and 12:00 noon to 11:30 p.m. on Sunday. Carry out hours are generally more limited for late night, for security purposes. General. We continue to attract franchisees with significant restaurant and retail experience. We consider our franchisees to be a vital part of our system’s continued growth and believe our relationship with our franchisees is good. As of December 25, 2016, there were 4,353 franchised Papa John’s restaurants operating in all 50 states and 45 countries and territories. During 2016, our franchisees opened an additional 330 (104 North America and 226 internationally) restaurants, which includes the opening of Papa John’s restaurants in six new countries. As of December 25, 2016, we have development agreements with our franchisees for approximately 220 additional North America restaurants, the majority of which are committed to open over the next two to three years, and agreements for approximately 1,080 additional international franchised restaurants, the majority of which are scheduled to open over the next six years. There can be no assurance that all of these restaurants will be opened or that the development schedule set forth in the development agreements will be achieved. Approval. Franchisees are approved on the basis of the applicant’s business background, restaurant operating experience and financial resources. We seek franchisees to enter into development agreements for single or multiple restaurants. We require each franchisee to complete our training program or to hire a full-time operator who completes the training and has either an equity interest or the right to acquire an equity interest in the franchise operation. For most non-traditional operations and for operations outside the United States, we will allow an approved operator bonus plan to substitute for the equity interest. North America Development and Franchise Agreements. We enter into development agreements with our franchisees in North America for the opening of a specified number of restaurants within a defined period of time and specified geographic area. Our standard domestic development agreement includes a fee of $25,000 before consideration of any incentives. The franchise agreement is generally executed once a franchisee secures a location. Our current standard franchise agreement requires the franchisee to pay a royalty fee of 5% of sales, and the majority of our existing franchised restaurants have a 5% royalty rate in effect. Over the past several years, we have offered various development incentive programs for domestic franchisees to accelerate unit openings. Such incentives included the following for 2016 traditional openings: (1) waiver of the standard one-time $25,000 franchise fee if the unit opens on time in accordance with the agreed-upon development schedule, or a reduced fee of $5,000 if the unit opens late; (2) the waiver of some or all of the 5% royalty fee for a period of time; (3) a credit for a portion of the purchase of certain leased equipment; and (4) a credit to be applied toward a future food purchase, under certain circumstances. We believe development incentive programs have accelerated unit openings and expect they will continue to do so in 2017. Substantially all existing franchise agreements have an initial 10-year term with a 10-year renewal option. We have the right to terminate a franchise agreement for a variety of reasons, including a franchisee’s failure to make payments when due or failure to adhere to our operational policies and standards. Many state franchise laws limit our ability as a franchisor to terminate or refuse to renew a franchise. equipment packages through an approved third-party supplier. We sell replacement smallwares and related items to our franchisees. Each franchisee is responsible for selecting the location for its restaurants but must obtain our approval of the restaurant design and location based on traffic accessibility and visibility of the site and targeted demographic factors, including population density, income, age and traffic. Reduced-cost direct mail campaigns from Preferred Marketing Solutions (“Preferred,” our wholly owned print and promotions subsidiary). In 2017, we plan to offer some or all of these domestic franchise support initiatives. International Development and Franchise Agreements. We opened our first franchised restaurant outside the United States in 1998. We define “international” as all markets outside the United States and Canada. In international markets, we have either a development agreement or a master franchise agreement with a franchisee for the opening of a specified number of restaurants within a defined period of time and specified geographic area. Under a master franchise agreement, the franchisee has the right to sub-franchise a portion of the development to one or more sub-franchisees approved by us. Under our current standard international development or master franchise agreement, the franchisee is required to pay total fees of $25,000 per restaurant: $5,000 at the time of signing the agreement and $20,000 when the restaurant opens or on the agreed-upon development date, whichever comes first. Additionally, under our current standard master franchise agreement, the master franchisee is required to pay $15,000 for each sub-franchised restaurant — $5,000 at the time of signing the agreement and $10,000 when the restaurant opens or on the agreed-upon development date, whichever comes first. Our current standard international master franchise and development agreements provide for payment to us of a royalty fee of 5% of sales. For international markets with sub-franchise agreements, the effective sub-franchise royalty received by the Company is generally 3% of sales and the master franchisee generally receives a royalty of 2% of sales. The remaining terms applicable to the operation of individual restaurants are substantially equivalent to the terms of our domestic franchise agreement. From time to time, development agreements will be negotiated at other-than-standard terms for fees and royalties, and we may offer various development and royalty incentives to help drive net unit growth and results. Non-traditional Restaurant Development. We had 240 non-traditional domestic restaurants at December 25, 2016. Non-traditional restaurants generally cover venues or areas not originally targeted for traditional unit development, and our franchised non-traditional restaurants have terms differing from the standard agreements. Franchisee Loans. Selected domestic and international franchisees have borrowed funds from us, principally for the purchase of restaurants from us or other franchisees or for construction and development of new restaurants. Loans made to franchisees can bear interest at fixed or floating rates and in most cases are secured by the fixtures, equipment and signage of the restaurant and/or are guaranteed by the franchise owners. At December 25, 2016, net loans outstanding totaled $13.6 million. See “Note 11” of “Notes to Consolidated Financial Statements” for additional information. Domestic Franchise Training and Support. Our domestic field support structure consists of franchise business directors, each of whom is responsible for serving an average of 130 franchised units. Our franchise business directors maintain open communication with the franchise community, relaying operating and marketing information and new initiatives between franchisees and us. Company-certified management operations training program. Ongoing compliance with training is monitored by the Global Operations Support and Training team. Multi-unit franchisees are encouraged to appoint training store general managers or hire a full-time training coordinator certified to deliver Company-approved operational training programs. International Franchise Operations Support. We employ or contract with international business directors who are responsible for supporting one or more franchisees. The international business directors usually report to regional vice presidents. Senior management and corporate staff also support the international field teams in many areas, including but not limited to food safety, quality assurance, marketing, technology, operations training and financial analysis. Franchise Operations. All franchisees are required to operate their Papa John’s restaurants in compliance with our policies, standards and specifications, including matters such as menu items, ingredients, and restaurant design. Franchisees have full discretion in human resource practices, and generally have full discretion to determine the prices to be charged to customers, but we have the authority to set maximum price points for nationally advertised promotions. Franchise Advisory Council. We have a Franchise Advisory Council (“FAC”) that consists of Company and franchisee representatives of domestic restaurants. We also have a franchise advisory council in the United Kingdom (“UK FAC”). The FAC and UK FAC and subcommittees hold regular meetings to discuss new product and marketing ideas, operations, growth and other business issues. From time to time, certain domestic franchisees have also formed a separate franchise association for the purpose of communicating and addressing issues, needs and opportunities among its members. We currently communicate with, and receive input from, our franchisees in several forms, including through the FAC, UK FAC, annual operations conferences, system communications, national conference calls, various regional meetings conducted with franchisees throughout the year and ongoing communications from franchise business directors and international business directors in the field. Monthly webcasts are also conducted by the Company to discuss current operational, marketing or other issues affecting the domestic franchisees’ business. We are committed to communicating with our franchisees and receiving input from them. The United States Quick Service Restaurant pizza (“QSR Pizza”) industry is mature and highly competitive with respect to price, service, location, food quality and product innovation. There are well-established competitors with substantially greater financial and other resources than Papa John’s. The category is largely fragmented and competitors include international, national and regional chains, as well as a large number of local independent pizza operators, any of which can utilize a growing number of food delivery services. Some of our competitors have been in existence for substantially longer periods than Papa John’s and can have higher levels of restaurant penetration and stronger, more developed brand awareness in markets where we compete. According to industry sources, domestic QSR Pizza category sales, which includes dine-in, carry out and delivery, totaled approximately $34.9 billion in 2016, or an increase of 1% from the prior year. With respect to the sale of franchises, we compete with many franchisors of restaurants and other business concepts. There is also active competition for management personnel and attractive commercial real estate sites suitable for Papa John’s restaurants. various federal and state laws governing such matters as minimum wage requirements, benefits, working conditions, citizenship requirements, and overtime. We are subject to Federal Trade Commission (“FTC”) regulation and various state laws regulating the offer and sale of franchises. The laws of several states also regulate substantive aspects of the franchisor-franchisee relationship. The FTC requires us to furnish to prospective franchisees a franchise disclosure document containing prescribed information. State laws that regulate the franchisor-franchisee relationship presently exist in a significant number of states, and bills have been introduced in Congress from time to time that would provide for federal regulation of the U.S. franchisor-franchisee relationship in certain respects if such bills were enacted. The state laws often limit, among other things, the duration and scope of non-competition provisions and the ability of a franchisor to terminate or refuse to renew a franchise. Some foreign countries also have disclosure requirements and other laws regulating franchising and the franchisor-franchisee relationship. 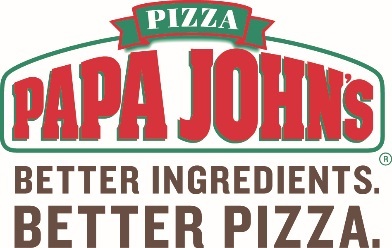 National, state and local government regulations or initiatives, including health care legislation, “living wage,” legislation imposing “joint employer liability” or other current or proposed regulations and increases in minimum wage rates affect Papa John’s as well as others within the restaurant industry. As we expand internationally, we are also subject to applicable laws in each jurisdiction. We are increasingly subject to laws and regulations that require us to disclose calorie content and other specific content of our food, including fat, trans fat, and salt content. A provision of the Patient Protection and Affordable Care Act of 2010 (ACA) requires us and many restaurant companies to disclose calorie information on restaurant menus. The Food and Drug Administration issued final rules to implement this provision beginning in May 2017, which will require restaurants to post the number of calories for most items on menus or menu boards and to make other nutritional information available. A number of states, counties and cities in which we do business have also enacted menu labeling laws. Government regulation of nutrition disclosure and advertising could result in increased costs of compliance and could also impact consumer habits in a way that adversely impacts sales at our restaurants. For further information regarding governmental regulation, see Item 1A, Risk Factors. Our intellectual property rights are a significant part of our business. We have registered and continue to maintain federal registrations through the United States Patent and Trademark Office (the “USPTO”) for the marks PAPA JOHN’S, PIZZA PAPA JOHN’S & Design (our logo), BETTER INGREDIENTS. BETTER PIZZA., PIZZA PAPA JOHN’S BETTER INGREDIENTS. BETTER PIZZA. & Design, and PAPA REWARDS. We also own federal registrations through the USPTO for several ancillary marks, principally advertising slogans. Moreover, we have registrations for and/or have applied for PIZZA PAPA JOHN’S & Design in more than 100 foreign countries and the European Community, in addition to international registrations for PAPA JOHN’S and PIZZA PAPA JOHN’S BETTER INGREDIENTS. BETTER PIZZA. & Design in various foreign countries. From time to time, we are made aware of the use by other persons in certain geographical areas of names and marks that are the same as or substantially similar to our marks. It is our policy to pursue registration of our marks whenever possible and to vigorously oppose any infringement of our marks. We hold copyrights in authored works used in our business, including advertisements, packaging, training, and promotional materials. In addition, we have registered and maintain Internet domain names, including “papajohns.com,” and approximately 75 country code domains patterned as papajohns.cc, with “.cc” representing a specific country code. As of December 25, 2016, we employed approximately 23,100 persons, of whom approximately 20,100 were restaurant team members, approximately 900 were restaurant management personnel, approximately 800 were corporate personnel and approximately 1,300 were QC Center and Preferred personnel. Most restaurant team members work part-time and are paid on an hourly basis. None of our team members are covered by a collective bargaining agreement. We consider our team member relations to be good. We are subject to various risks that could have a negative effect on our business, financial condition and results of operations. These risks could cause actual operating results to differ from those expressed in certain “forward looking statements” contained in this Form 10-K as well as in other Company communications. Before you invest in our securities, you should carefully consider these risk factors together with all other information included in this Form 10-K and our other publicly filed documents. Our profitability may suffer as a result of competition in our industry. The QSR Pizza industry is mature and highly competitive. Competition is based on price, service, location, food quality, brand recognition and loyalty, product innovation, effectiveness of marketing and promotional activity, use of technology, and the ability to identify and satisfy consumer preferences. From time to time, we may need to reduce the prices for some of our products to respond to competitive and customer pressures, which may adversely affect our profitability. When commodity and other costs increase, we may be limited in our ability to increase prices. With the significant level of competition and the pace of innovation, we may be required to increase investment spending in several areas including marketing and technology, which can decrease profitability. In addition to competition with our larger and more established competitors who have substantially greater financial and other resources than we do, we face competition from new competitors and concepts such as fast casual pizza concepts. We also face competitive pressures from food delivery concepts using new delivery technologies, some of which may have more effective marketing. The emergence or growth of new competitors may make it difficult for us to maintain or increase our market share and could negatively impact our sales and our system-wide restaurant operations. One of our competitive strengths is our “Better Ingredients. Better Pizza.” brand promise. This means that we may use ingredients that cost more than the ingredients some of our competitors may use. Because of our investment in higher-quality ingredients and our focus on a “clean label”, we could have lower profit margins than some of our competitors if we are not able to establish or maintain premium pricing for our products. Changes in consumer preferences or discretionary consumer spending could adversely impact our results. Changes in consumer preferences and trends (for example, changes in consumer perceptions of certain ingredients that could cause consumers to avoid pizza or some of its ingredients in favor of foods that are perceived as more healthful, lower-calorie or otherwise based on their ingredients or nutritional content) or preferences for a dining experience such as fast casual pizza concepts, could adversely affect our restaurant business. Also, our success depends to a significant extent on numerous factors affecting consumer confidence and discretionary consumer income and spending, such as general economic conditions and the level of employment. Any factors that could cause consumers to spend less on food or shift to lower-priced products could reduce sales or inhibit our ability to maintain or increase pricing, which could materially adversely affect our results of operations. Food safety and quality concerns may negatively impact our business and profitability. Incidents or reports of food- or water-borne illness or other food safety issues, investigations or other actions by food safety regulators, food contamination or tampering, employee hygiene and cleanliness failures, improper franchisee or employee conduct, or presence of communicable disease at our restaurants (Company-owned and franchised), QC Centers, or suppliers could lead to product liability or other claims. If we were to experience any such incidents or reports, our brand and reputation could be negatively impacted. This could result in a significant decrease in customer traffic and could negatively impact our revenues and profits. Similar incidents or reports occurring at quick service restaurants unrelated to us could likewise create negative publicity, which could negatively impact consumer behavior towards us. We rely on our domestic and international suppliers, as do our franchisees, to provide quality ingredients and to comply with applicable laws and industry standards. A failure of one of our domestic or international suppliers to meet our quality standards, or meet domestic or international food industry standards, could result in a disruption in our supply chain and negatively impact our brand and our results. Our results depend upon our ability to differentiate our brand and our reputation for quality. Damage to our brand or reputation could negatively impact our business and financial results. Our brand has been highly rated in U.S. surveys, and we strive to build the value of our brand as we develop international markets. The value of our brand and demand for our products could be damaged by any incidents that harm consumer perceptions of the Company and our brand. As a result of the impact of social media, the value of our brand and the demand for our products could be quickly and seriously damaged due to the widespread publicity that can be associated with one or more of these incidents. We may not be able to effectively market our products or maintain key marketing partnerships. The success of our business depends on the effectiveness of our marketing and promotional plans. We may not be able to effectively execute our national or local marketing plans, particularly if lower sales result in reduced levels of funds from PJMF. Our marketing strategy utilizes relationships with well-known sporting events, athletes, celebrity personalities and our brand spokesman to market our products. Our business could suffer if we are not able to maintain key marketing relationships and sponsorships, or if we are unable to do so at a reasonable cost, and could require additional investments in alternative marketing strategies. Actions taken by persons or marketing partners endorsing our products that harm their reputations could also cause harm to our brand. Changes in privacy laws could adversely affect our ability to market our products effectively. We rely on a variety of direct marketing techniques, including email, text messages and postal mailings. Any future restrictions in federal, state or foreign laws regarding marketing and solicitation or international data protection laws that govern these activities could adversely affect the continuing effectiveness of email, text messages and postal mailing techniques and could force changes in our marketing strategies. If this occurs, we may need to develop alternative marketing strategies, which could impact the amount and timing of our revenues. We may not be able to execute our strategy or achieve our planned growth targets, which could negatively impact our business and our financial results. Our growth strategy depends on our and our franchisees’ ability to open new restaurants and to operate them on a profitable basis. We expect substantially all of our international unit growth and much of our domestic unit growth to be franchised units. Accordingly, our profitability increasingly depends upon royalty revenues from franchisees. If our franchisees are not able to operate their businesses successfully under our franchised business model, our results could suffer. Additionally, we may fail to attract new qualified franchisees or existing franchisees may close underperforming locations. Planned growth targets and the ability to operate new and existing restaurants profitably are affected by economic, regulatory and competitive conditions and consumer buying habits. Increased commodity or operating costs, including, but not limited to, employee compensation and benefits or insurance costs, could slow the rate of new store openings or increase the number of store closings. Our business is susceptible to adverse changes in local, national and global economic conditions, which could make it difficult for us to meet our growth targets. Additionally, we or our franchisees may face challenges securing financing, finding suitable store locations at acceptable terms or securing required domestic or foreign government permits and approvals. If we do not meet our growth targets or the expectations of the market for net restaurant openings or our other strategic objectives, our stock price could decline. Our franchisees remain dependent on the availability of financing to remodel or renovate existing locations, upgrade systems and enhance technology, or construct and open new restaurants. From time to time, the Company may provide financing to certain franchisees and prospective franchisees in order to mitigate store closings, allow new units to open, or complete required upgrades. If we are unable or unwilling to provide such financing, which is a function of, among other things, a franchisee’s credit worthiness, the number of new restaurant openings may be slower than expected and our results of operations may be adversely impacted. To the extent we provide financing to franchisees in domestic and international markets, our results could be negatively impacted by negative performance of these franchisee loans. We may be adversely impacted by increases in the cost of food ingredients and other costs. We are exposed to fluctuations in commodities. An increase in the cost or sustained high levels of the cost of cheese or other commodities could adversely affect the profitability of our system-wide restaurant operations, particularly if we are unable to increase the selling price of our products to offset increased costs. Cheese, representing our largest food cost, and other commodities can be subject to significant cost fluctuations due to weather, availability, global demand and other factors that are beyond our control. Additionally, increases in labor, mileage, insurance, fuel, and other costs could adversely affect the profitability of our restaurant and QC Center businesses. Most of the factors affecting costs in our system-wide restaurant operations are beyond our control, and we may not be able to adequately mitigate these costs or pass along these costs to our customers or franchisees, given the significant competitive pricing pressures. Our dependence on a sole supplier or a limited number of suppliers for some ingredients could result in disruptions to our business. Domestic restaurants purchase substantially all food and related products from our QC Centers. We are dependent on Leprino Foods Dairy Products Company (“Leprino”) as our sole supplier for cheese, one of our key ingredients. Leprino, one of the major pizza category suppliers of cheese in the United States, currently supplies all of our cheese domestically and substantially all of our cheese internationally. While we have no other sole sources of supply for key ingredients, we do source other key ingredients from a limited number of suppliers. Alternative sources of supply of cheese or other key ingredients may not be available on a timely basis or may not be available on terms as favorable to us as under our current arrangements. Our Company-owned and franchised restaurants could also be harmed by a prolonged disruption in the supply of products from or to our QC Centers due to weather, climate change, natural disasters, crop disease, food safety incidents, labor dispute or interruption of service by carriers. In particular, adverse weather or crop disease affecting the California tomato crop could disrupt the supply of pizza sauce to our and our franchisees’ restaurants. Insolvency of key suppliers could also cause similar business interruptions and negatively impact our business. Natural disasters or other catastrophic events may disrupt our operations or supply chain. The occurrence of a natural disaster, epidemic, cyber-attack or other catastrophic event may result in the closure of our restaurants (Company-owned or franchised), our corporate office, any of our QC Centers or the facilities of our suppliers, any of which could materially adversely affect our results of operations. Changes in purchasing practices by our domestic franchisees could harm our commissary business. Although our domestic franchisees currently purchase substantially all food products from our QC Centers, they are only required to purchase from our QC Centers pizza sauce, dough and other items we may designate as proprietary or integral to our system. Any changes in purchasing practices by domestic franchisees, such as seeking alternative approved suppliers of ingredients or other food products, could adversely affect the financial results of our QC Centers and the Company. Our current insurance may not be adequate and we may experience claims in excess of our reserves. Our insurance programs for workers’ compensation, owned and non-owned automobiles, general liability, property and team member health insurance coverage are funded by the Company up to certain retention levels, generally ranging from $100,000 to $1 million. These insurance programs or our program for cyber insurance may not be adequate to protect us, and it may be difficult or impossible to obtain additional coverage or maintain current coverage at a reasonable cost. We also have experienced increasing claims volatility and higher related costs for workers’ compensation, owned and non-owned automobiles and health claims. We estimate loss reserves based on historical trends, actuarial assumptions and other data available to us, but we may not be able to accurately estimate reserves. If we experience claims in excess of our projections, our business could be negatively impacted, and our franchisees could be similarly impacted by higher claims experience. Our international operations are subject to increased risks and other factors that may make it more difficult to achieve or maintain profitability or meet planned growth rates. Our international operations could be negatively impacted by volatility and instability in international economic, political, security or health conditions in the countries in which the Company or our franchisees operate, especially in emerging markets. In addition, there are risks associated with differing business and social cultures and consumer preferences. We may face limited availability for restaurant locations, higher location costs and difficulties in franchisee selection and financing. We may be subject to difficulties in sourcing and importing high-quality ingredients (and ensuring food safety) in a cost-effective manner, hiring and retaining qualified team members, marketing effectively and adequately investing in information technology, especially in emerging markets. Our international operations are also subject to additional risk factors, including import and export controls, compliance with anti-corruption and other foreign laws, changes in tax laws, difficulties enforcing intellectual property and contract rights in foreign jurisdictions, and the imposition of increased or new tariffs or trade barriers. We intend to continue to expand internationally, which would make the risks related to our international operations more significant over time. Our international results, which are substantially franchised, depend heavily on the operating capabilities and financial strength of our franchisees, particularly due to the fact that our international revenues are concentrated among a small number of countries, including the UK, the GCC, Russia, and China. Any changes in the ability of our franchisees to run their stores profitably in accordance with our operating procedures, or to effectively sub franchise stores, could result in brand damage, a higher number of restaurant closures and a reduction in the number of new restaurant openings. Our international Company-owned store presence is currently limited to our stores in China, which are classified as held for sale. We may find it difficult to find a suitable buyer for our Company-owned stores in China in a timely fashion, or a new franchisee could develop the market more slowly than we anticipate, which could delay our growth in this market. Foreign currency or interest rate risks could adversely affect our financial results. Sales made by our franchisees in international markets are denominated in their local currencies, and fluctuations in the U.S. dollar occur relative to the local currencies. Accordingly, changes in currency exchange rates will cause our revenues and operating results to fluctuate, which occurred in 2016 due to the volatility of the Russian Ruble and British Pound. We have not historically hedged our exposure to foreign currency fluctuations. Our international revenues and earnings may be adversely impacted as the U.S. dollar rises against foreign currencies, because the local currency will translate into fewer U.S. dollars. Additionally, the value of certain assets or loans denominated in local currencies may deteriorate. Other items denominated in U.S dollars including product imports or loans may also become more expensive, putting pressure on franchisees’ cash flows. Under our revolving credit facility, we are exposed to variable interest rates. A significant increase in interest rates or total borrowings could adversely affect our profitability. Additionally, rising interest rates could impact our franchisees and their ability to open new restaurants or operate existing restaurants profitably. Increasingly complex laws and regulations could adversely affect our business. We operate in an increasingly complex regulatory environment, and the cost of regulatory compliance is increasing. Our failure, or the failure of any of our franchisees, to comply with applicable U.S. and international labor, health care, food, health and safety, consumer protection, anti-bribery and corruption, competition, environmental and other laws, may result in civil and criminal liability, damages, fines and penalties. Enforcement of existing laws and regulations, changes in legal requirements, and/or evolving interpretations of existing regulatory requirements may result in increased compliance costs and create other obligations, financial or otherwise, that could adversely affect our business, financial condition or operating results. Increased regulatory scrutiny of food matters and product marketing claims, and increased litigation and enforcement actions, may increase compliance and legal costs and create other obligations that could adversely affect our business, financial condition or operating results. Governments may also impose requirements and restrictions that impact our business. For example, some local government agencies have implemented ordinances that restrict the sale of certain food or drink products. Compliance with new or additional government laws or regulations, including menu labeling requirements, could increase costs and be harmful to system-wide restaurant sales. Non-compliance with laws or government regulations could result in enforcement actions or investigations and could have an adverse impact on our financial performance and our reputation. Changes in employment and labor laws, including health care legislation and minimum wage increases, could increase costs for our system-wide operations. We are subject to federal, state and foreign laws governing such matters as minimum wage requirements, overtime compensation, benefits, working conditions, citizenship requirements and discrimination and family and medical leave. Labor costs and labor-related benefits are primary components in the cost of operation of our restaurants and QC Centers. Labor shortages, increased employee turnover and health care mandates could increase our system-wide labor costs. A significant number of hourly personnel are paid at rates closely related to the federal and state minimum wage requirements. Accordingly, the enactment of additional state or local minimum wage increases above federal wage rates or regulations related to exempt employees could increase labor costs for our domestic system-wide operations. Additionally, social media may be used to foster negative perceptions of employment in our industry and promote strikes or boycotts. The Affordable Care Act, enacted in 2010, requires employers such as us to provide health insurance for all qualifying employees in the United States or pay penalties for not providing coverage. We, like other industry competitors, are complying with the law and are providing more extensive health benefits to employees than we had previously provided, and are subsidizing a larger portion of their insurance premiums. These additional costs, or costs related to future healthcare regulation, could negatively impact our operational results. In addition, our franchisees subject to the ACA or future healthcare legislation could face additional cost pressures from compliance with the legislation, which could reduce their future expansion of units. Failure to retain the services of our Founder, John Schnatter, as Chief Executive Officer, Chairman and brand spokesman, or to successfully execute succession planning, could harm our Company and brand. John H. Schnatter, our Founder, Chairman and Chief Executive Officer, does not serve under an employment agreement, and we do not maintain key man life insurance on Mr. Schnatter. We also depend on the continued availability of Mr. Schnatter’s image and his services as spokesman in our advertising and promotion materials. While we have entered into a license agreement with Mr. Schnatter related to the use of certain intellectual property related to his name, likeness and image, our business and brand may be harmed if Mr. Schnatter’s services were not available to the Company for any reason or the reputation of Mr. Schnatter were negatively impacted. In addition, failure to effectively execute succession planning with respect to Mr. Schnatter and other senior leaders, or managing any related organizational change, could harm our Company and brand. The concentration of stock ownership with Mr. Schnatter may influence the outcome of certain matters requiring stockholder approval. The concentration of stock ownership by our Founder, Chairman and Chief Executive Officer allows him to substantially influence the outcome of certain matters requiring stockholder approval. As of December 25, 2016, he beneficially owned approximately 26% of our outstanding common stock. As a result, he may be able to substantially influence the strategic direction of the Company and the outcome of matters requiring approval by our stockholders. We rely on information technology to operate our businesses and maintain our competitiveness, and any failure to invest in or adapt to technological developments or industry trends could harm our business. both domestically and internationally. Our failure to adequately invest in new technology, adapt to technological developments and industry trends, particularly our digital ordering capabilities, could result in a loss of customers and related market share. Additionally, we are in an environment where the technology life cycle is short, which requires continued reinvestment in technology and increases the risk that our technology may not be customer centric or could become obsolete, inefficient or otherwise incompatible with other systems. We rely on our international franchisees to maintain their own point-of-sale and online ordering systems, which are often purchased from third-party vendors, potentially exposing international franchisees to more operational risk, including cyber and data privacy risks. Disruptions of our critical business or information technology systems could harm our ability to compete and conduct our business. Our critical business and information technology systems could be damaged or interrupted by power loss, various technological failures, user errors, sabotage or acts of God. In particular, we may experience occasional interruptions of our digital ordering solutions, which make online ordering unavailable or slow to respond, negatively impacting sales and the experience of our customers. If our digital ordering solutions do not perform with adequate speed, our customers may be less inclined to return to our digital ordering solutions. Part of our technology infrastructure, such as our FOCUS point-of-sale system, is specifically designed for us and our operational systems, which could cause unexpected costs, delays or inefficiencies when infrastructure upgrades are needed or prolonged and widespread technological difficulties occur. Significant portions of our technology infrastructure, particularly in our digital ordering solutions, are provided by third parties, and the performance of these systems is largely beyond our control. Failure of our third-party systems, and backup systems, to adequately perform, particularly as our online sales grow, could harm our business and the satisfaction of our customers. Such third-party systems could be disrupted either through system failure or if third party vendor patents and contractual agreements do not afford us protection against similar technology. In addition, we may not have or be able to obtain adequate protection or insurance to mitigate the risks of these events or compensate for losses related to these events, which could damage our business and reputation and be expensive and difficult to remedy or repair. Failure to maintain the integrity of internal or customer data could result in damage to our reputation, loss of sales, and/or subject us to litigation, penalties or significant costs. We are subject to a number of privacy and data protection laws and regulations. Our business requires the collection and retention of large volumes of internal and customer data, including credit card data and other personally identifiable information of our employees and customers housed in the various information systems we use. Constantly changing information security threats, particularly persistent cyber security threats, pose risks to the security of our systems and networks, and the confidentiality, availability and integrity of our data and the availability and integrity of our critical business functions. As techniques used in cyber-attacks evolve, we may not be able to timely detect threats or anticipate and implement adequate security measures. The integrity and protection of the customer, employee, franchisee and Company data are critical to us. Our information technology systems and databases, and those provided by our third party vendors, including international vendors, have been, and will continue to be subject to computer viruses, malware attacks, unauthorized user attempts, phishing and denial of service and other malicious attacks. The failure to prevent fraud or security breaches or to adequately invest in data security could harm our business and revenues due to the reputational damage to our brand. Such a breach could also result in litigation, regulatory actions, penalties, and other significant costs to us and have a material adverse effect on our financial results. These costs could be significant and well in excess of our cyber insurance coverage. We have been and will continue to be subject to various types of investigations and litigation, including collective and class action litigation, which could subject us to significant damages or other remedies. commercial and other matters arising in the ordinary course of business. We have been subject to claims in cases containing collective and class action allegations. Plaintiffs in these types of lawsuits often seek recovery of very large or indeterminate amounts, and the magnitude of the potential loss and defense costs relating to such lawsuits may not be accurately estimated. Litigation trends involving the relationship between franchisors and franchisees, personal injury claims, employment law and intellectual property may increase our cost of doing business. We evaluate all of the claims and proceedings involving us to assess the expected outcome, and where possible, we estimate the amount of potential losses to us. In many cases, particularly collective and class action cases, we may not be able to estimate the amount of potential losses and/or our estimates may prove to be insufficient. These assessments are made by management based on the information available at the time made and require the use of a significant amount of judgment, and actual outcomes or losses may materially differ. Regardless of whether any claims against us are valid, or whether we are ultimately held liable, such litigation may be expensive to defend and may divert resources away from our operations and negatively impact earnings. Further, we may not be able to obtain adequate insurance to protect us from these types of litigation matters or extraordinary business losses. We may not be able to adequately protect our intellectual property rights, which could negatively affect our results of operations. We depend on the Papa John’s brand name and rely on a combination of trademarks, service marks, copyrights, and similar intellectual property rights to protect and promote our brand. We believe the success of our business depends on our continued ability to exclusively use our existing marks to increase brand awareness and further develop our brand, both domestically and abroad. We may not be able to adequately protect our intellectual property rights, and we may be required to pursue litigation to prevent consumer confusion and preserve our brand’s high-quality reputation. Litigation could result in high costs and diversion of resources, which could negatively affect our results of operations, regardless of the outcome. We may be subject to impairment charges. Impairment charges are possible due to the nature and timing of decisions we make about underperforming assets or markets, or if previously opened or acquired restaurants perform below our expectations. This could result in a decrease in our reported asset value and reduction in our net income. The United Kingdom’s departure from the European Union could have a negative impact on our business and financial results. The June 2016 referendum by United Kingdom voters known as “Brexit” has resulted in a lower valuation of the British Pound in comparison to the U.S. Dollar, and resulted in significant currency exchange rate fluctuations. While the future impact and other implications of Brexit on our operations in the European Union remain unclear, it has the potential to increase currency volatility, disrupt trade with changes in tariffs and regulations, impede the free movement of goods needed in our operations, and otherwise create global economic uncertainty and negatively impact consumer sentiment. As of December 25, 2016, six of our 45 international country operations are included in the European Union. As of December 25, 2016, there were 5,097 Papa John’s restaurants system-wide. The following tables provide the locations of our restaurants. We define “North America” as the United States and Canada and “domestic” as the contiguous United States. Note: Company-owned Papa John’s restaurants include restaurants owned by majority-owned subsidiaries. There were 222 such restaurants at December 25, 2016 (32 in Colorado, 35 in Maryland, 33 in Minnesota, 93 in Texas, 26 in Virginia, and 3 in Georgia). Most Papa John’s Company-owned restaurants are located in leased space. The initial term of most domestic restaurant leases is generally five years with most leases providing for one or more options to renew for at least one additional term. Generally, the leases are triple net leases, which require us to pay all or a portion of the cost of insurance, taxes and utilities. In connection with the 2016 sale of our Phoenix market, we also remain contingently liable for payment under 42 lease arrangements. Eight of our 11 North America QC Centers are located in leased space. We are party to a lease for a twelfth QC Center that is under construction and will open in 2017 in Georgia. Our remaining three locations are in buildings we own. Additionally, our corporate headquarters and our printing operations located in Louisville, KY are in buildings owned by us. Our international leases include our Company-owned restaurant sites in Beijing and North China. At December 25, 2016, we also leased and subleased to franchisees in the United Kingdom 286 of the 353 franchised Papa John’s restaurant sites. The initial lease terms on the franchised sites in the United Kingdom are generally 10 to 15 years. The initial lease terms of the franchisee subleases are generally five to ten years. We also lease our QC Centers and office space in Beijing, China, and Mexico City, Mexico. Additionally, we own a full-service QC Center in the United Kingdom. The Company is involved in a number of lawsuits, claims, investigations and proceedings, consisting of intellectual property, employment, consumer, commercial and other matters arising in the ordinary course of business. In accordance with Financial Accounting Standards Board (“FASB”) Accounting Standards Codification (“ASC”) 450, “Contingencies,” the Company has made accruals with respect to these matters, where appropriate, which are reflected in the Company’s consolidated financial statements. We review these provisions at least quarterly and adjust these provisions to reflect the impact of negotiations, settlements, rulings, advice of legal counsel and other information and events pertaining to a particular case. See “Note 17” of “Notes to Consolidated Financial Statements” for additional information. Ages are as of January 1, 2017. John H. Schnatter created the Papa John’s concept and started operations in 1984. He currently serves as Founder, Chairman and Chief Executive Officer. He previously served as Interim Chief Executive Officer from December 2008 to April 2009, Executive Chairman of the Company from 2005 until May 2007, as Chairman of the Board and Chief Executive Officer from 1990 until 2005, and as President from 1985 to 1990, from 2001 until 2005 and from 2014 to 2015. Steve M. Ritchie was appointed President and Chief Operating Officer in July 2015 after serving as Senior Vice President and Chief Operating Officer since May 2014. Mr. Ritchie has served as a Senior Vice President since May 2013 and in various capacities of increasing responsibility over Global Operations & Global Operations Support and Training since July 2010. Since 2006, he also has served as a franchise owner and operator of multiple units in the Company’s Midwest Division. Timothy C. O’Hern was appointed Senior Vice President and Chief Development Officer in July 2012. He previously served as Senior Vice President, Development since June 2009, a position he previously held from 2005 until 2007. From 2002 until 2005 and from 2007 until 2009, he managed the operations of a Papa John’s franchisee in which he has an ownership interest. Prior to his departure from Papa John’s in 2002, Mr. O’Hern held various positions, including Vice President of Global Development from February 2001 to 2002, Vice President of U.S. Development from March 1997 to February 2001, Director of Franchise Development from December 1996 to March 1997 and Construction Manager from November 1995 to December 1996. He has been a franchisee since 1993. Lance F. Tucker was appointed Chief Administrative Officer in July 2012 and Chief Financial Officer and Treasurer in February 2011. Mr. Tucker previously held the positions of Chief of Staff and Senior Vice President, Strategic Planning from June 2010 to February 2011, after serving as Chief of Staff and Vice President, Strategic Planning since June 2009. Mr. Tucker was previously employed by the Company from 1994 to 1999 working in its finance department. From 2003 to 2009, Mr. Tucker served as Chief Financial Officer of Evergreen Real Estate, a company owned by John Schnatter. Mr. Tucker is a licensed Certified Public Accountant. There are no family relationships between any of the directors or executive officers of the Company. Our Board of Directors declared a quarterly dividend of $0.20 per share on January 26, 2017 that was payable on February 17, 2017 to shareholders of record at the close of business on February 6, 2017. We anticipate continuing the payment of quarterly cash dividends. The actual amount of such dividends is subject to declaration by our Board of Directors and will depend upon future earnings, results of operations, capital requirements, our financial condition and other relevant factors. There can be no assurance that the Company will continue to pay quarterly cash dividends. Our Board of Directors has authorized the repurchase of up to $1.575 billion of common stock under a share repurchase program that began December 9, 1999, and expires February 28, 2018. This includes $50 million authorized in December 2016. In fiscal 2016, a total of 2.1 million shares with an aggregate cost of $122.4 million and an average price of $57.03 per share were repurchased under this program. Subsequent to year-end, we acquired an additional 86,801 shares at an aggregate cost of $7.4 million. Approximately $129.9 million remained available under the Company’s share repurchase program as of February 14, 2017. Our share repurchase authorization increased by $50 million to $1.575 billion in December 2016. For presentation purposes, the maximum dollar value of shares that may be purchased was adjusted retroactively to September 26, 2016. The Company utilizes a written trading plan under Rule 10b5-1 under the Securities Exchange Act of 1934, as amended, from time to time to facilitate the repurchase of shares of our common stock under this share repurchase program. There can be no assurance that we will repurchase shares of our common stock either through a Rule 10b5-1 trading plan or otherwise. 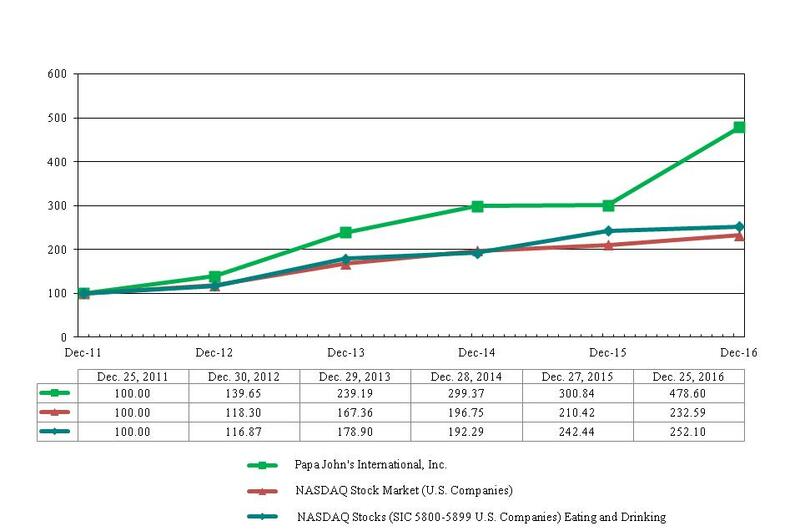 The following performance graph compares the cumulative shareholder return of the Company’s common stock for the five-year period between December 25, 2011 and December 25, 2016 to (i) the NASDAQ Stock Market (U.S.) Index and (ii) a group of the Company’s peers consisting of U.S. companies listed on NASDAQ with standard industry classification (SIC) codes 5800-5899 (eating and drinking places). Management believes the companies included in this peer group appropriately reflect the scope of the Company’s operations and match the competitive market in which the Company operates. The graph assumes the value of the investments in the Company’s common stock and in each index was $100 on December 25, 2011, and that all dividends were reinvested. The selected financial data presented for each of the fiscal years in the five-year period ended December 25, 2016, were derived from our audited consolidated financial statements. The selected financial data below should be read in conjunction with “Management’s Discussion and Analysis of Financial Condition and Results of Operations” and the “Consolidated Financial Statements” and Notes thereto included in Item 7 and Item 8, respectively, of this Form 10-K.
We operate on a 52-53 week fiscal year ending on the last Sunday of December of each year. The 2012 fiscal year consisted of 53 weeks and all other years above consisted of 52 weeks. The additional week resulted in additional revenues of approximately $21.5 million and additional income before income taxes of approximately $4.1 million, or $0.05 per diluted share for 2012. North America franchise royalties were derived from franchised restaurant sales of $2.20 billion in 2016, $2.13 billion in 2015, $2.04 billion in 2014, $1.91 billion in 2013 and $1.85 billion in 2012 ($1.82 billion on a 52 week basis). Includes international royalties and fees, restaurant sales for international Company-owned restaurants, and international commissary revenues. International royalties were derived from franchised restaurant sales of $648.9 million in 2016, $592.7 million in 2015, $553.0 million in 2014, $460.0 million in 2013 and $388.4 million in 2012 ($379.4 million on a 52 week basis). Restaurant sales for international Company-owned restaurants were $14.5 million in 2016, $19.3 million in 2015, $23.7 million in 2014, $22.7 million in 2013 and $16.2 million in 2012. Represents the noncontrolling interests’ allocation of income for our joint venture arrangements. Represents the redemption value of a mandatorily redeemable noncontrolling interest. Upon removal of the redemption feature through a contractual amendment during 2014, the noncontrolling interest was reclassified from other long-term liabilities to stockholders’ equity in the consolidated balance sheet. Papa John’s International, Inc. (referred to as the “Company,” “Papa John’s” or in the first person notations of “we,” “us” and “our”) began operations in 1984. At December 25, 2016, there were 5,097 Papa John’s restaurants in operation, consisting of 744 Company-owned and 4,353 franchised restaurants. Our revenues are derived from retail sales of pizza and other food and beverage products to the general public by Company-owned restaurants, franchise royalties, and sales of franchise and development rights. Additionally, approximately 42% to 46% of our North America revenues in each of the last three years were derived from sales to franchisees of various items including food and paper products, printing and promotional items, risk management services and information systems equipment, and software and related services. We also derive revenues from the operation of three international QC centers. We believe that in addition to supporting both Company and franchised profitability and growth, these activities contribute to product quality and consistency throughout the Papa John’s system. New unit openings in 2016 were 343 as compared to 357 in 2015 and 388 in 2014 and unit closings in 2016 were 139 as compared to 127 in 2015 and 153 in 2014. Our expansion strategy is to cluster restaurants in targeted markets, thereby increasing consumer awareness and enabling us to take advantage of operational, distribution and advertising efficiencies. We continue to generate strong sales in our domestic Company-owned restaurants in a very competitive environment. Average annual Company-owned sales for our most recent domestic comparable restaurant base were $1.16 million for 2016, compared to $1.12 million for 2015 and $1.06 million for 2014. Average sales volumes in new markets are generally lower than in those markets in which we have established a significant market position. The comparable sales for domestic Company-owned restaurants increased 4.4% in 2016, 5.9% in 2015 and 8.2% in 2014. “Comparable sales” represents sales generated by restaurants open for the entire twelve-month period reported. We are pleased with the ongoing growth in both our North America and international franchise restaurant sales. The comparable sales for North America franchised units increased 3.1% in 2016, 3.6% in 2015 and 6.2% in 2014. The comparable sales for International franchised units increased 6.0% in 2016, 6.9% in 2015 and 7.4% in 2014. We strive to obtain high-quality restaurant sites with good access and visibility, and to enhance the appearance and quality of our restaurants. We believe these factors improve our image and brand awareness. The average cash investment for the 12 domestic traditional Company-owned restaurants opened during 2016 was approximately $339,000, exclusive of land and any tenant improvement allowances we received, compared to the $319,000 investment for the 11 domestic traditional units opened in 2015. Over the past few years we have experienced an increase in the cost of our new restaurants primarily as a result of building larger units to accommodate increased sales, an increase in the cost of certain equipment as a result of technology enhancements, and increased costs to comply with local regulations. In September 2015, the Company decided to refranchise the China Company-owned market and is planning a sale of its existing China operations, consisting of 42 Company-owned restaurants and a commissary. We expect to sell the business during 2017; upon completion of the sale, the Company will not have any Company-owned international restaurants. We have classified the assets as held for sale within the consolidated balance sheet. Upon the classification of these assets to held for sale in 2015, no loss was recognized as their fair value exceeded their carrying value. In the fourth quarter of 2016, due to the length of time the China operations had been on the market, we determined that the fair value no longer exceeded the carrying value of the associated assets. As a result of our impairment analysis, we recorded an impairment loss of $1.4 million for the period ended December 25, 2016. This amount is included in refranchising and impairment gains/(losses), net in the consolidated statements of income. This charge includes the write-off of all goodwill associated with the assets held for sale, an impairment loss for stores we expect to close in 2017, and a valuation allowance on the remaining assets held for sale. charge of $1.4 million noted above. The loss in 2014 includes an impairment charge of $1.0 million for eleven Company-owned restaurants in China. We do not expect the sale of our China operations to have a significant impact on our financial results in 2017. See “Note 7” of “Notes to Consolidated Financial Statements” for additional information. We establish reserves for uncollectible accounts and notes receivable based on overall receivable aging levels and a specific evaluation of accounts and notes for franchisees and other customers with known financial difficulties. Balances are charged off against the allowance after recovery efforts have ceased. The Company has five joint ventures in which there are noncontrolling interests. Consolidated net income is required to be reported separately at amounts attributable to both the parent and the noncontrolling interest. Additionally, disclosures are required to clearly identify and distinguish between the interests of the parent company and the interests of the noncontrolling owners, including a disclosure on the face of the consolidated statements of income attributable to the noncontrolling interest holder. *The change in redemption value is recorded as an adjustment to “Redeemable noncontrolling interests” and “Retained earnings” in the consolidated balance sheets. See “Note 6” of “Notes to Consolidated Financial Statements” for additional information. Compensation expense for equity grants is estimated on the grant date, net of projected forfeitures and is recognized over the vesting period (generally in equal installments over three years). Restricted stock is valued based on the market price of the Company’s shares on the date of grant. Stock options are valued using a Black-Scholes option pricing model. The risk-free interest rate for the periods within the contractual life of an option is based on the U.S. Treasury yield curve in effect at the time of grant. The expected dividend yield was estimated as the annual dividend divided by the market price of the Company’s shares on the date of grant. Expected volatility was estimated by using the Company’s historical share price volatility for a period similar to the expected life of the option. See “Note 18” of “Notes to Consolidated Financial Statements” for additional information. We evaluate goodwill annually in the fourth quarter or whenever we identify certain triggering events or circumstances that would more-likely-than-not reduce the fair value of a reporting unit below its carrying amount. Such tests are completed separately with respect to the goodwill of each of our reporting units, which includes our domestic Company-owned restaurants, China and the United Kingdom (“PJUK”) operations. We may perform a qualitative assessment or move directly to the quantitative assessment for any reporting unit in any period if we believe that it is more efficient or if impairment indicators exist. We elected to perform a qualitative assessment for our domestic Company-owned restaurants, China and PJUK reporting units in 2016. As a result of our qualitative analyses, we determined that it was more-likely-than-not that the fair values of our reporting units were greater than their carrying amounts. This assessment excluded the goodwill allocated to assets held for sale in 2016 as it was separately evaluated. Subsequent to completing our goodwill impairment tests, no indicators of impairment were identified. See “Note 8” of “Notes to Consolidated Financial Statements” for additional information. Our insurance programs for workers’ compensation, owned and non-owned automobiles, general liability, property, and health insurance coverage provided to our employees are funded by the Company up to certain retention levels. Retention limits generally range from $100,000 to $1.0 million per occurrence. Losses are accrued based upon undiscounted estimates of the aggregate retained liability for claims incurred using certain third-party actuarial projections and our claims loss experience. The estimated insurance claims losses could be significantly affected should the frequency or ultimate cost of claims differ significantly from historical trends used to estimate the insurance reserves recorded by the Company. See “Note 12” of “Notes to Consolidated Financial Statements” for additional information. Papa John’s is subject to income taxes in the United States and several foreign jurisdictions. Significant judgment is required in determining Papa John’s provision for income taxes and the related assets and liabilities. The provision for income taxes includes income taxes paid, currently payable or receivable and those deferred. basis to reduce deferred tax assets to the amounts we expect to realize. As of December 25, 2016, we had a net deferred income tax liability of approximately $9.3 million. Tax authorities periodically audit the Company. We record reserves and related interest and penalties for identified exposures as income tax expense. We evaluate these issues and adjust for events, such as statute of limitations expirations, court rulings or audit settlements, which may impact our ultimate payment for such exposures. We recognized a decrease in income tax expense of $729,000 in 2016, and increases in income tax expense of $731,000 in 2015 and $117,000 in 2014 associated with the finalization of certain income tax matters. See “Note 15” of “Notes to Consolidated Financial Statements” for additional information.